The adjustable track clamps pair with the WTX Clamp edge perfectly and allow you to cut angles or hold material with ease. Use the Bora Clamp for professional results. Create work stops, custom set ups or extra holding power with ease. The Bosch TS1020 Dual-Activation Cartridge is exclusively designed for use with the Bosch GTS1041A REAXX 10 In. jobsite table saw. The dual-activation cartridge is part of the saw's Active Response Technology, which imparts a low-voltage electrical signal onto the blade. The signal alters upon contact with user's skin, triggering a chemical reaction in an activation cylinder similar to the deployment of an air bag in an automobile. In this case, instead of deploying an airbag, the chemical reaction fires a piston that pushes against the drop arm. This action rapidly forces the saw blade down and away from the operator, mitigating serious user injury. Each cartridge allows for two activations before replacement is needed. The dual-activation cartridge works with standard 10 In. fine finish and construction-grade blades and stacked dado blades. The Bosch TS1006 is a an insert assembly for the Bosch GTS1041A REAXX Table Saw, for use as either a zero-clearance insert or a dado insert. This helps the user to customize the experience the Bosch GTS1041A, using this high-quality attachment. 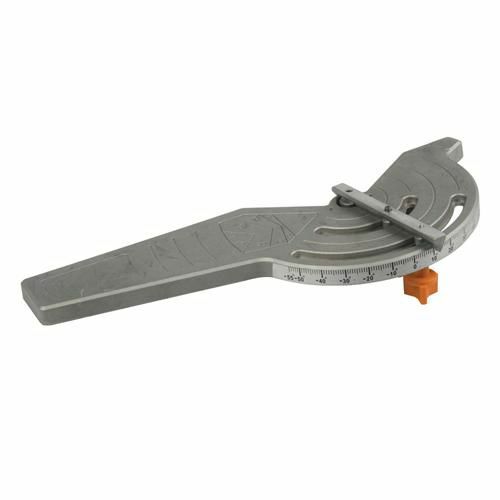 This zero clearance or dado insert table saw attachment is designed for exclusive use on the GTS1041A. When used as a zero-clearance insert, it allows users to make precision cuts at 90, reducing the kerf clearance to the thickness of the blade. It supports the workpiece closer to blade resulting in less chip-out and splintering. This attachment also includes the necessary hardware for use as a dado cutter insert, allowing for use with stacked dado cutters. Angle Guide is rated 1.0 out of 5 by 1. Rated 1 out of 5 by marcmen from little disappointed Purchased this angle guide and was returned because: 1. No Positive Stops 2. Miter was no accurate - Off by about 1/2 degree. Does not sound like much but if you are using the track saw this is huge over 5 - 8 feet!! I like Triton Tools but this guide is not worth the shipping charges.